AutoPot is a really useful hydroponic system that is suitable for the DIY home grower as well as for more commercial operations. One of the many key points to this system is that it is easy to scale it up or down making it quite a versatile system, added to that it is gravity fed from a central reservoir which means that you can also control the amount of maintenance the system needs, a bigger reservoir will feed the plants for longer, meaning that its more automated and can easily be left for longer between the need for attention. Take a look at the diagram below to see a simple AutoPot layout. What is needed for this hydroponic system? The AutoPots come in kits ready to use. They are generally available in single or double grow modules. 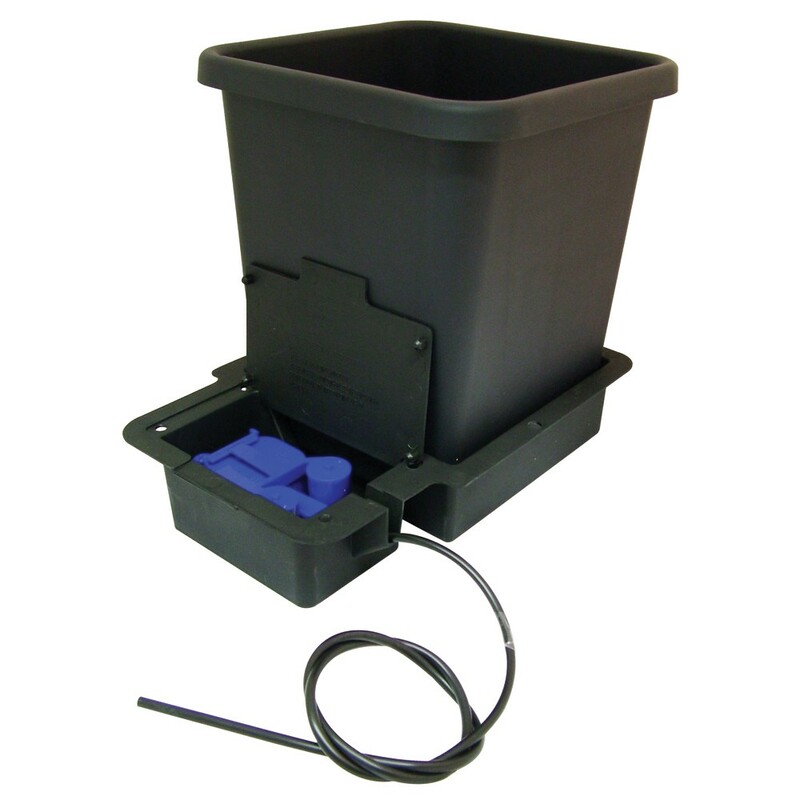 Each module comes with a pot to hold the medium and the chosen plant, a specially designed tray for the pot to sit in, a smart aqua valve to control the flow of nutrients, piping to connect them together if needed and of course a purpose built reservoir to hold the nutrient solution. 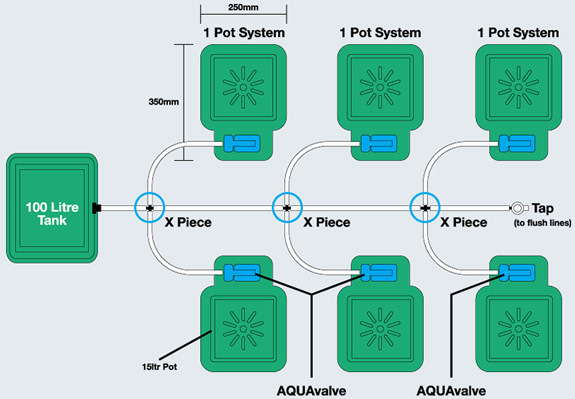 If you look at the image you’ll notice that the modules can be connected to the reservoir and each other by small pipes and valves, it’s this flexibility that makes the AutoPots hydroponics system scalable for home and commercial growers. The AutoPots also come with a specially designed mat that is woven with copper; this is a vital part to stop the roots clogging up the pipe works. How does an AutoPots Hydroponic system work? The AutoPots work using a specially designed nutrient solution delivery system that is very similar to a wick system in theory, you could also compare it to a flood and drain system except there is no return valve here and the nutrient solution only flows one way, which is into the pots. There is no run off or return on this system. As with any systems you have a chosen medium, the experienced growers we spoke to favour a 60/40 cocoa and clay pebble mix such as Gold Label Hydro Cocoa available from all good grow shops. This is added to the pots as usual. The pot then sits on the specially designed tray which has a special recess for the nutrients to sit ready for the plant to use, as you can see in the images. An important component here is the above mentioned matting; this has to sit on the tray before you put the pot in. Once you have placed the pot in the tray with the mat and filled it with medium and a plant you are ready to look at the nutrient delivery system. The system has a central reservoir to hold the nutrients and water mix, as with all hydroponics this solution will have to be PH balanced using a PH meter or kit and the amount of nutrients in the solution needs to be checked with a CF meter. The reservoir is connected to each pot using a pipe network; this allows the solution to flow down and into the tray under the pot. Each pipe has a non-return valve to allow the solution to only flow one way and its gravity fed so no need for an electric pump to deliver the solution, which itself is another bonus to this system. Once the solution runs down the pipe to the pots it then hits the aqua smart valve as it has been called. Again this is a vital component to the system. The valve works by allowing the nutrient solution to flow into the tray under the pot, the amount of nutrient solution allowed into the pot is controlled by the valve, it works in a similar way to the standard toilet cistern where a float rises and once it hits a certain level the flow is cut off, the plant absorbs the solution like in a wick system as it needs it, as the nutrient level in the tray decreases the smart valve opens up and allows more solution in until the desired level is reached then the valve shuts off again, it’s a simple take on simple technology that makes this system great and is favoured by many growers around the world. As with all hydroponics systems the solution in the reservoir will need to be changed every week to ensure vigorous growth that hydroponics deliver, but this is a pretty low maintenance way of growing making it suitable for people who can’t maintain the garden every day. All systems have their own pros and cons, below is what we think of the AutoPots. Clean out and change the nutrient solution once a week, don’t be lazy it’s worth the effort. Clean the pipes at the same time by allowing clean water to run through the waste valve. Do not use organics such as Nitrazyme etc. in the reservoir, instead top feed these using a jug or similar when needed. Ensure all pipes are not kinked or trapped limiting flow. Thoroughly clean and disinfect in-between full grow cycles using something like Attaclean.